...be in South Padre Island, Texas where this picture was taken. On July 28th I will be! I'm going to South Padre with my friend Natasha, but until then, I have to be here. 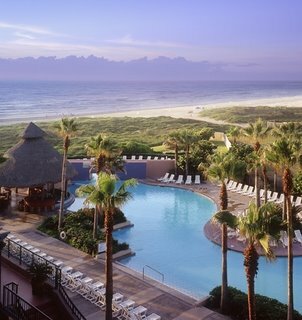 The problem is, I see how good it looks to be in Padre and want to be there, but I can't skip the next 18 days to get there. I think much of life is the same way. We don't understand why we're here instead of there. We compile our lists of what we'd rather be...instead of what is! When is enough? Much of life, I've discovered in my 26 years consists of learning how to be content with what you have been portioned and learning how to wait patiently. So while I'd rather be in South Padre, I have to wait until it comes. I must learn how to be content right here, right now. I can drive myslef crazy in the wait or I can rest in it. Either way, surely there is something the Lord will teach me or show me between now and July 28? I will have to wait for that too! "I'd rather be...here, because here is all I am promised." I stumbled across your blog when going through a friend's where you had commented. I must say, this is a great blog! Your insight and humility in sharing greatly impress and inspire me. What struck me most about your blog though, was that in every little thing - such as a Diet Coke addiction, or barking dogs - in your daily life, you turn into a lesson for your heart. This struck me and made me ask myself, "How often do I consider things like these oppertunities for me to inspect my heart?" Well, I just wanted to thank you for having the boldness and passion for Christ that you have, as is obvious in this blog. Keep on keeping on! "For whether you eat, drink, or whatever you do, do ALL for the glory of GOD." As a child, when I would wish my birthday would hurry or some other selfish desire, my mom would say, "don't wish your life away. Try to enjoy each day." I know you will enjoy your days at the beach. Find the joy in those leading up to it also. txteacher...funny, that is what my mom used to tell me too!